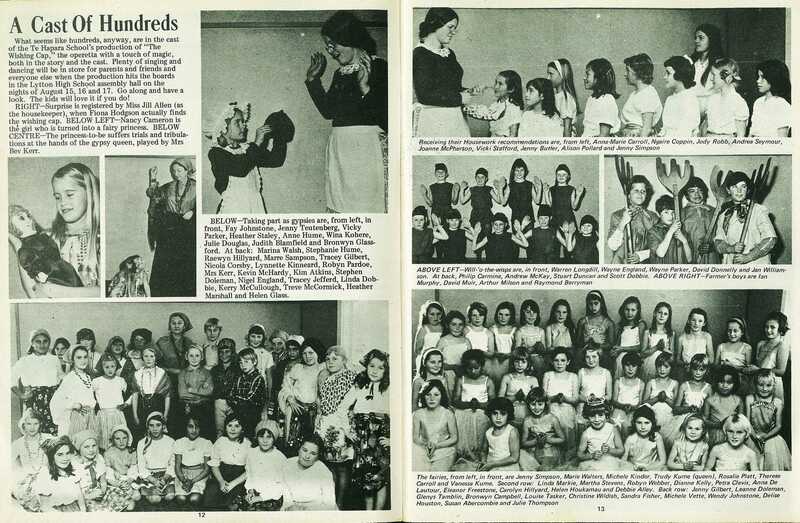 What seems like hundreds, anyway, are in the cast of the Te Hapara School's production of "The Wishing Cap," the operetta with a touch of magic, both in the story and the cast. Plenty of singing and dancing will be in store for parents and friends and everyone else when the production hits the boards in the Lytton High School assembly hall on the nights of August 15, 16 and 17. 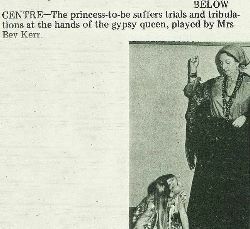 Go along and have a look. The kids will love it if you do! 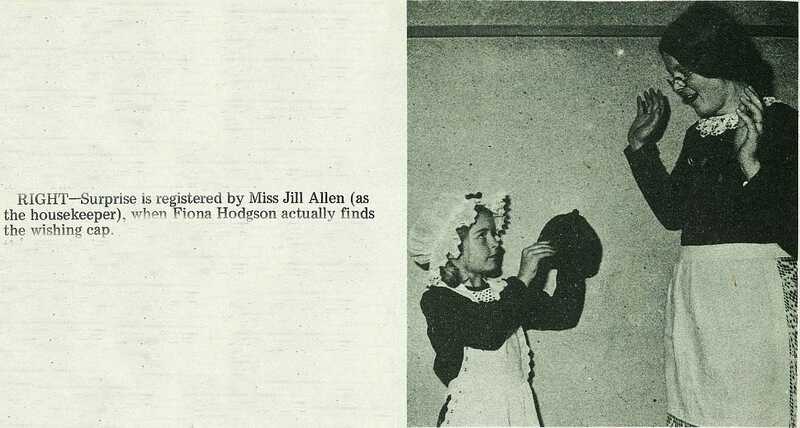 Surprise is registered by Miss Jill Allen (as the housekeeper), when Fiona Hodgson actually finds the wishing cap. 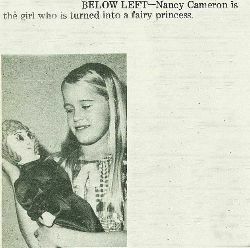 Nancy Cameron is the girl who is turned into a fairy princess. 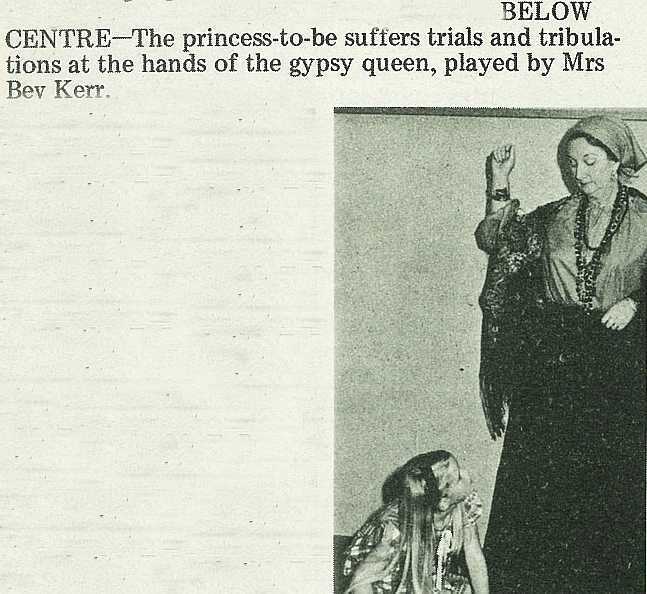 The princess-to-be suffers trials and tribulations at the hands of the gypsy queen, played by Mrs Bev Kerr. 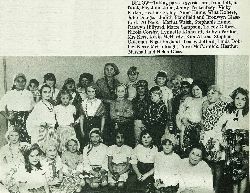 Taking part as gypsies are, from left, in front, Fay Johnstone, Jenny Teutenberg, Vicky Parker, Heather Staley, Anne Hume, Wina Kohere, Julie Douglas, Judith Blamfield and Bronwyn Glassford. At back: Marina Walsh, Stephanie Hume, Raewyn Hillyard, Marre Sampson, Tracey Gilbert, Nicola Corsby, Lynnette Kinneard, Robyn Pardoe, Mrs Kerr, Kevin McHardy, Kim Atkins, Stephen Doleman, Nigel England, Tracey Jefferd, Linda Dob-bie, Kerry McCullough, Treve McCormick, Heather Marshall and Helen Glass. Will-'o-the-wisps are, in front, Warren Longdill, Wayne England, Wayne Parker, David Donnelly and Jan Williamson. At back, Philip Carmine, Andrew McKay, Stuart Duncan and Scott Dobbie.